this is a 16″x 20″ acrylic painting on canvas. the background was painted with brushes and the shapes were done with palette knives. this was the first acrylic painting i’ve done in quite awhile. painting with acrylics (i don’t use oils because of the well known drawbacks.) on canvas is always a treat. i’d always do it that way, but i don’t have anywhere near enough storage space for piles and piles of canvases. my husband tells me that my paintings look like great backgrounds, so i have been trying to have distinct structures in my work. i dunno. i think maybe i prefer the great background kind of painting. it’s what comes naturally. 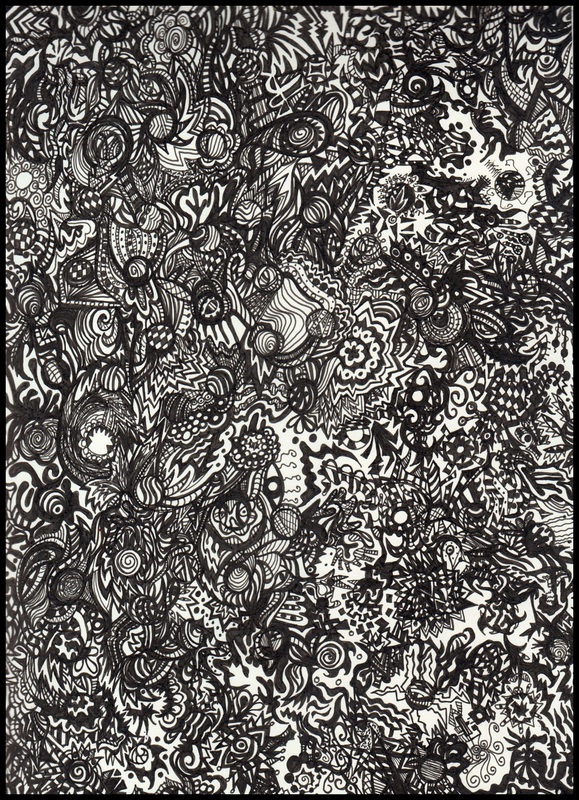 the title indicates that i used up 2 pens drawing this and it took me two days to create the whole thing.